March 2018 Blog Hop Inspiration from Papertrey Ink! Today is the 25th of March and it is Papertrey Ink's Blog Hop. Today we get to see a lot of inspiration from some amazing papercrafts. 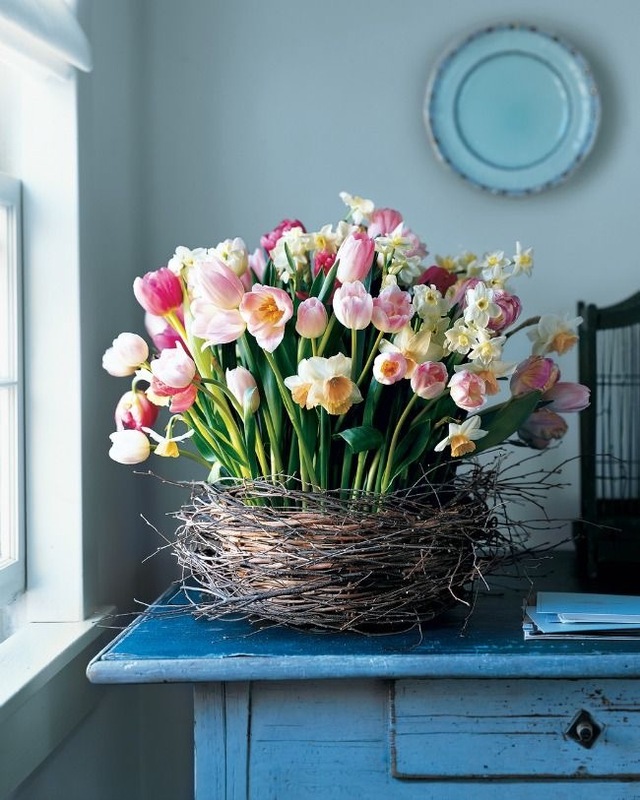 The inspirational photo above is beautiful and who wouldn't love to have this on there table for Easter or anytime! My inspiration from this picture is from the beautiful soft colors in the yellow color family going to yellow orange and yellow greens and a little splash of the pinks. I did color blending using the Quatrefoil stencil. After color blending the love sentiment using Tag Sale 12, I used foam tape to give it some dimension. This is a special card I gave to my husband for our 31st Anniversary, which was on March 21st. Enjoy the hop, hop, hop:)! Nancy, this is beautiful! Love the soft stenciled background and your lovely sentiment and flower detailing! Lovely card! Nancy this is so pretty with the stenciled background! Loving that vellum sentiment strip as well! Happy 31 Anniversary to you both, Congratulations! That bg is amazing! You blended the bright sunny colors perfectly! 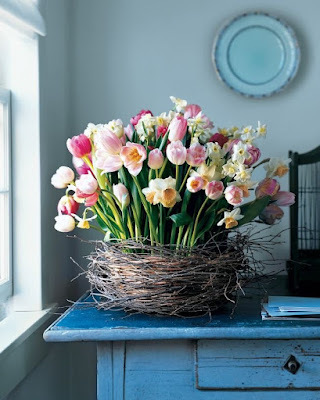 Love how you simplified the bouquet to one amazing bloom. Lovely, lovely card! Beautiful card and colors. I love your amazing background and your lovely focal image. Lovely card! Nancy, This is lovely. Your colors and color blending are so soft and spring-like. I love everything about this card. Love it! Especially the subtle flower spring peeking out. What a pretty card. Happy Anniversary! I enjoy how everyone interprets the photo just a little bit differently. Your blended background is a wonderful way to capture the colors of the flowers. Happy anniversary, Nancy. Gorgeous card! Your blending is amazing! 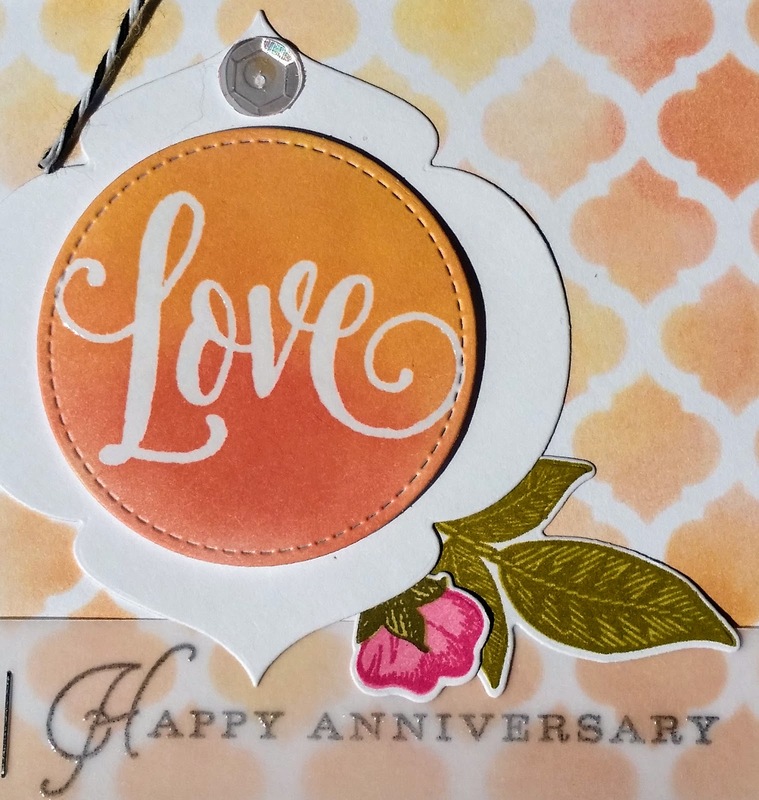 Love how you used the ornament die - your stenciled background is beautiful with the colors you used - and that little flower stem tucked behind is lovely! Very pretty with you sponged background. So beautiful! Love the colors and beautiful stenciling and the vellum sentiment strip with the staple... cool look! Love it! Oh I love this so much! That tag is my all time favorite and your stenciling is perfect. I have that same stencil and I need to pull it out and use it. Thanks for the inspiration. Hi Nancy, I love the warm colors and your pretty flower images. Such pretty blending too, great job! Such a lovely anniversary card! Your coloring looks amazing. Love the soft peach and the tiny pink bloom peeking out at the bottom. The colors are beautifully blended on this card. Congrats on your anniversary--wonderful milestone! Love how you blended the colors on the tag & the stenciled background--great card! The stenciled background is wonderful! 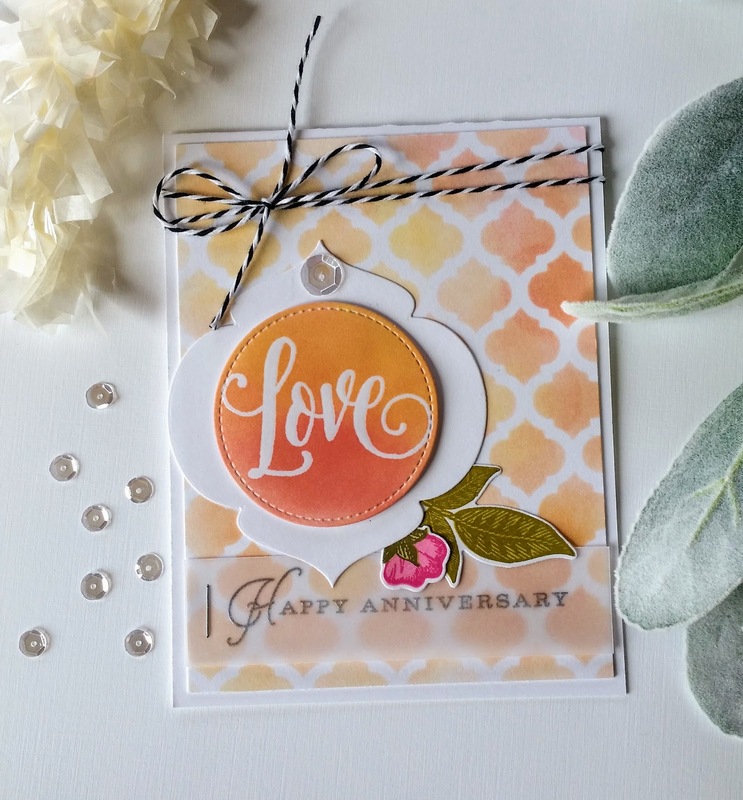 What lovely blended colors on a special card! Sweet! Love how the shape of tag echoes the stencil.